These musical paperweights are manufactured in Switzerland, under the "Romance" brand by Reuge, the famous Swiss musical box manufacturer. 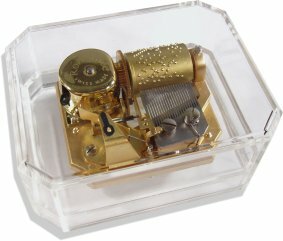 The transparent paperweight is fitted with a 22 note single tune movement, wound from the underneath, with a pull stopper so the movement can be switched on or off. They make ideal gifts for any occasion. This musical paperweight is available with a choice of three different tunes.